Made from recycled plastic and available in all the colors. 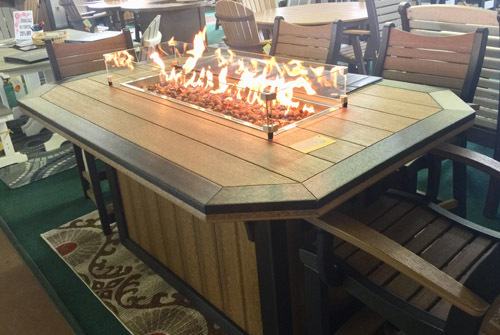 The Gas Fire Island is a great item and it is available in counter, bar or dining heights. Use as a walk up bar, a picnic table or great for romantic dining. Dress it up or down, works great for all occasions. The burner is 100,000BTUs and can be use with propane or natural gas. Add benches or chairs.